Here's a link to my review of the PS3 which is still sitting in my lounge and is indeed growing on me (even though it won't display an image on my main TV and has to be plugged into my computer monitor). I think the glitch is to do with my AOC flatscreen TV rather than the PS3 itself. I think the PS3 deserves to have a great future, but at the price point it has entered the market ($1199), it's out of the league of the average kiwi. 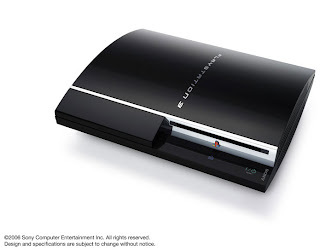 People point out that the PS2 also debuted over the $1000 mark, but dropped quickly in price. That is true, but the PS3 includes a number of things that make it expensive to produce - the Cell processor and the Blu-ray drive to name just two components. It's unlikely that the price drop will be as rapid, but I can still see Sony matching the price of the combined Xbox 360 and HD-DVD drive purchase price of $969. The debut of the Xbox Elite, a sort of premium version of the Xbox 360 featuring a HDMI connection brings the Xbox up to he standard it should have been launched at, but again excludes an HD-DVD drive. This is the surest sign that Microsoft is less than confident of success with this high definition technology. There’s Sony’s black box which plays Blu-ray discs, Nintendo’s pint-sized Wii which doesn’t play DVDs at all, and then there’s Microsoft’s high definition plug-in. When the software giant was preparing its Xbox 360 console for launch back in 2005, it made a serious call – not to include a high definition disc drive as a standard feature. The drives weren’t available in reliable supply back then and would have boosted the cost of the Xbox 360 by several hundred dollars. Instead, Microsoft decided to build a separate drive which Xbox owners could buy as an accessory and it’s that drive which has just gone on sale here. In terms of aesthetics, the HD-DVD drive doesn’t do much for me – it’s bulky, need sits own power pack and makes for a lopsided partner to the Xbox 360. But the drive is actually quite good at what it does – play high definition DVDs. It connects to the Xbox 360 via a USB cable, employs the Xbox menu which you’re already used to and comes with a decent multimedia remote control. Set-up is easy. The included DVD configures the Xbox for the new drive. The opening credits for King Kong were appearing barely five minutes after I plugged the drive in. And what a sight Peter Jackson’s epic gorilla flick is in high definition. I compared it directly with the standard DVD version and the picture appears crisper, Jackson’s admittedly computer generated world look more lifelike. HD-DVD allows some useful new DVD menu features you won’t have seen yet. Picture in picture lets you watch additional documentaries or out-takes while the movie is playing and you can choose a new chapter from within the movie. Real movie buffs can bookmark there favourite scenes for replay. The one major technical downside of the Xbox add-on is its lack of a HDMI connection slot. These are built into the latest flat-screen TVs and allow you to send a digital, high-definition signal from media players directly to the TV set. The absence of HDMI, means many people won’t have TVs that can support the true high definition quality the Xbox 360 drive supports – the so-called “1080p” video mode. That’s a big disappointment, but the next quality level down, 1080i, which my TV accepts, is still miles better than regular DVD quality. Sony’s PS3 makes for a tidier living room and, for many, a smoother transition to true high definition, but there’s an advantage for consumers in Microsoft keeping the drive out of the Xbox. It’s still unclear how the high definition format war between HD-DVD and Blu-ray will pan out and as an optional add-on, the drive doesn’t force you down any particular fork in the road just yet. For those who want to jump in now, it makes for an affordable way into the HD realm.